Lainey Young has a secret: she’s going crazy. Everyone else thinks she has severe migraines from stress and exhaustion. What she really has are visions of how people died—or are going to die. Not that she tells anyone that. At age sixteen, she prefers keeping her crazy to herself. When doctors insist she needs a new and stable environment to recover, Lainey’s game to spend two years at a private New England boarding school. She doesn’t really think it will cure her problem, and she’s half right. There is no cure, but as she discovers, she’s not actually crazy. Almost everyone at Northbrook Academy has a secret too. Half the students and nearly all the staff are members of the Sententia, a hidden society of the psychically gifted. A vision of another student’s impending death confirms Lainey is one of them. She’d like to return the crappy gift of divining deaths with only a touch, but enjoys spending time with Carter Penrose—recent Academy graduate and resident school crush—while learning to control it. 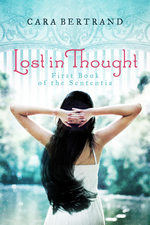 Lainey’s finally getting comfortable with her ability, and with Carter, when they uncover her true Sententia heritage. Now she has a real secret. Once it’s spilled, she’ll be forced to forget protecting secrets and start protecting herself.